While Wrightsville Beach was the point of landfall for Hurricane Florence, our beautiful beach town was fortunate to get busy with repairs and recovery shortly after the storm passed. Residents affected by the mandatory evacuation were able to return home shortly with the Wrightsville Beach Drawbridge re-opening two days after Florence left the coast. Although Florence is a storm many will never forget, its impact on Wrightsville Beach and the region left residents and visitors anxiously awaiting its return to normalcy. With beach goers out and about, restaurants, bars and businesses now open, the island life as we know it is returning to Wrightsville Beach. Ideal temperatures, fall-centric events and scenic beach views make now the perfect time to start planning your trip. Please be sure to contact accommodations and attractions directly if you have questions regarding availability. Bark in the Park, Oct. 6, showcases the Skyhoundz Hyperflite Canine Disc Championship making it the perfect event for your four-legged friend. Calling all surfers, just over the bridge at Waterman’s Brewing, the Carolina Surf Film Festival features the best shreds on screen Oct. 19-20. The annual Surf to Sound takes to the water Nov. 2-4 with advanced and intermediate paddle boarders navigating the Atlantic Ocean, Masonboro Inlet and flat-water courses around Harbor Island. It’s not all paddle though, the event also features live music, beer tastings and SUP clinics. If you’re seeking more land-based competition, the Wrightsville Beach Turkey Trot includes a 5K or one-mile walk around beautiful Wrightsville Beach. Spend a long Thanksgiving weekend ringing in the Holiday season with Wrightsville Beach’s signature event, the North Carolina Holiday Flotilla. There&apos;s plenty of beautiful options to get out and about in nature. Catch an oceanside sunrise then spend a fall morning perusing local provisions at Wrightsville Beach Farmers’ Market. Take a bike ride around the island or go for a late afternoon stroll on The Loop. End the day with a spectacular sunset on the South End. As island life resumes, Wrightsville Beach is preparing to welcome fall visitors to our little slice of paradise. 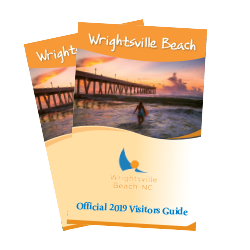 While planning a visit to Wrightsville Beach is a great way to help the local economy, many residents are still rebuilding their lives after Hurricane Florence. Read about more ways to help those still in need and recovery here.